Welcome to Crystal sands VillaRight on the Beach! 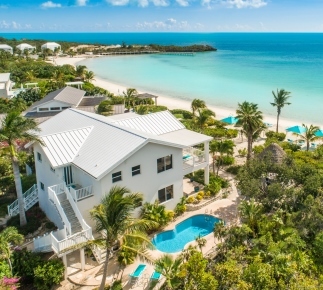 Crystal Sands Villa on the Beach is a fabulous beachfront villa located in the exclusive residential section of Providenciales in the Turks and Caicos Islands, right on spectacular Sapodilla Bay Beach! Our sugary white sand and crystal clear turquoise water are tranquil and inviting! For about a hundred yards, the water is shallow enough for kids of all ages to wade knee high! The Children's Beach. If you are looking for a wonderful vacation in paradise, then you have found it here! We would love to have you stay with us! Crystal Sands Villa is one 4 bedroom villa which has two independent bedroom suites, perfect for family gatherings or two family groups. Each of the four bedrooms has a direct view of the beach! The rooms are large, open and airy. The villa is Non-Smoking. Our villa can accommodate eight people in bedrooms. We have two additional twins by way of a bunk bed in the downstairs second bedroom Nanny room. We also have a Queen living room sleeper sofa downstairs. Crystal Sands Villa on the Beach! Providenciales is one of the most fabulous vacation spots in the Caribbean today! In the vacation rental business since early 2002, we have had the privilege of having over 3000 Happy Guests. Attesting to their wonderful vacations, guests have written over 425 Five Star reviews from many online listing sites. Read them on our Testimonials page! Our fresh water swimming pool is nestled in a beautiful garden setting for privacy. The gardens feature dozens of tropical flowering plants and plenty of shady places to sit. Our palapas offers a restful setting for enjoying our hammocks. * Four Bedrooms * Four Baths * Additional sleeping for children * Two separate suites: Penthouse and Beach Level * Rooms face the ocean beach with unparalleled views! * Perfect for multigenerational families or groups of friends! Nicknamed The Children's Beach, this setting on Sapodilla Bay is perfect for children of all ages. The quiet, calm, crystal clear waters of Sapodilla Bay are framed by sugary, white sand. Rarely is there ever wave action, creating an almost unreal serenity in this picture perfect cove. The water on our beach is so calm that the bay is a refuge for sailboats during inclement weather. The resulting picture is one you simply have to see to believe. The bay is protected by two points on either side. The Caicos Bank is directly in front of our villa and its shallow geography creates a tranquil setting, as the white sands collect on our beach. We simply have not found a comparable beach! Ship wrecked sailors? Take a short walk to see their stone carvings. Directly to our South atop Sapodilla Hill, there is a national treasure. Stone carvings attributed to sailors who shipwrecked years ago are scattered about the hilltop. The government has made efforts to protect the original treasures, but duplicates are placed for you to find! Everything about Crystal Sands Villa is spacious! Our oudoor living spaces provide sunny spots as well as shady retreats to rest and relax. Vacation comfort is a given, with the villa’s large living area with extra sofa bed and well planned baths, with large vanities, large walk in showers and fabulous storage! The balcony is magnificently 50 foot long and it is covered! Our fresh water swimming pool is nestled in a beautiful garden setting for privacy. The gardens feature dozens of tropical flowering plants and plenty of shady places to sit. Crystal Sands Villa’s configuration of two separate suites allows the entire family to vacation together, yet also to have private space when desired! Relax at Crystal Sands Villa's Beach! Crystal Sands Villa - Beachfront Living! Crystal Sands Villa's Panoramic View! Crystal Sands Villa's Bedrooms with views! Crystal Sands Villa - al fresco Dining! Our family had the most incredible trip and it all started at Crystal Sands Villa! Fantastic house, great planning and design on your parts! We came with our daughter’s family. We had the downstairs, they had the upstairs. Contact us today to make your reservation!Relax@crystalsandsvilla.com Inquire Now! Copyright © Crystal Sands Villa on the Beach, Right on the Beach!